Here is the wooden box cooker , made of 0.5 in plywood panels, with a window area of 19in x 14 in. A stainless steel basin was fitted inside, with foam insulation filling the space below the basin. A tempered glass window was fitted on a wooden frame which can be lifted out of the oven. The reflectors were again made of wooden frame, but with cardboard and aluminum foil lining which I can change easily.The reflector frame can be removed as such if higher temperatures are not required and for very slow cooking. The angle of tilt of reflectors is close to 60 degrees. Note that the front reflector is of lesser height. A "good cook" oven thermometer is placed inside. The maximum temperature reached is around 300F on a hot day at noon time. Crisp Chocolate chip cookies could be baked in about 2 hours.! My kind neighbor Ken Howland did all the wood work for me. I hope that this sturdy design would last for many many years of solar cooking/baking. 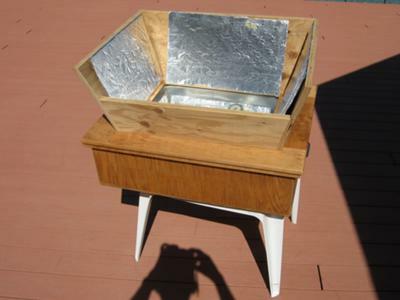 Than you for this great write up and description of your latest homemade wooden box solar oven, it looks great! You are always inspiring to other people when it comes to solar cooking and sharing your joy and enthusiasm for cooking with the power of the sun. Good morning! I am a sahm/military wife living in SE Georgia. I also home school our 3 boys. I would love to build a solar oven for our alternative energy unit. If I am going to take the time to do that, I would love for it to be sturdy enough to allow for long term use. Will you share with me more specific directions on the one above? It is perfect!